[At least one person — ok, so she's four and lives in our house — thinks this is funny.] Congratulations this week go out to Sarah Salzberg of Blacksburg, Virginia. Her "Orange Leaves" beat Image Capsule's "Spring Time" by a mere eleven votes out of over 1700 cast in last week's contest. I wish we could offer both of them, but as it is you can buy Sarah's design as a special limited edition for the next five days in the Spoonflower Etsy shop. To refresh your memory on last week's competing fabrics, check out our Flickr set of participating fabrics. Click here to let us know which design you like best. Voting closes next week on Tuesday. It's fun to follow the current vote count in real time. If you're looking for the contest rules and entry form, they are here. Boba Baby Carrier Fabric Design Contest: Help choose 16 finalists! 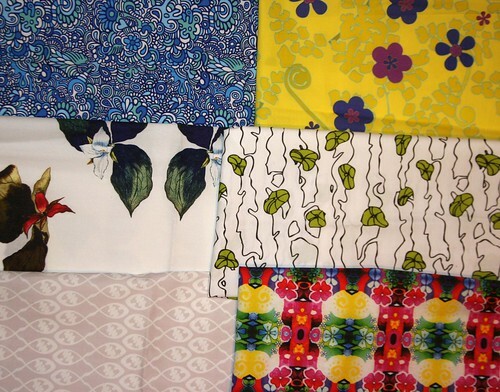 « Fabric shoppers unite–shop independents!